Your table setting will look elegant when you start with matching placemats. Our quality, high-wear placemats are handmade from a variety of materials. From Faux Leather to Genuine Leather any of our materials are a perfect choice. We offer custom materials, sizes and shapes as well for our placemats and coasters. 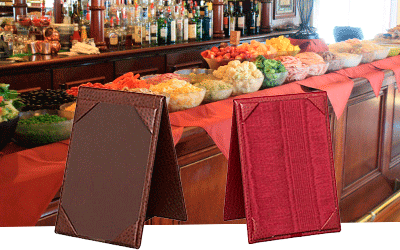 All have turned edges and are stitched for a polished look for fine dining establishments and county clubs. We are able to flush cut as well with an expanded vinyl material and no hard board for the pool area. Just flip it over! And of course they are easy to clean and durable. Be sure to add your logo for the polishing touch. 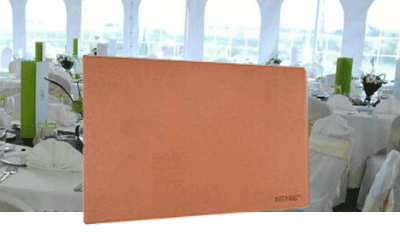 Our Placemats are a perfect finish to Board Rooms as well. Board Room mats can be made to fit your needs, made in any size to fit that custom board room table! Any of our covers may be used for Wine Presentation. Simply browse through our site and pick a style. You may choose any layout from a single panel presentation board a book style or the elegant captain’s book or ring binder for multiple pages. Choose one of our Stock Dies to use in combination with your logo. Matching check presenters complete your presentation. 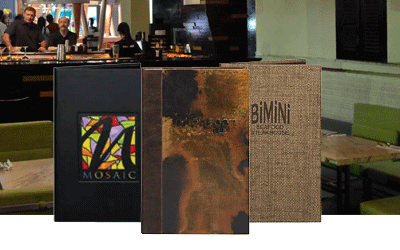 Any of our menu styles are available in a matching check presenter. Choose simple diagonal pockets; add a pen loop and credit card pocket. Stamping with your logo is an option or just a simple “Thank You”. We also offer a standard heat sealed check presenter. These are padded with a heat sealed edge and we stock black and burgundy colors for those rush jobs. 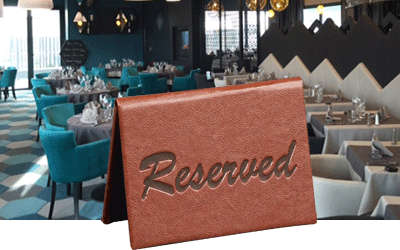 Our Hospitality Collection ranges from our standard room directories and compendiums to desk blotters. Please see any of the material lines for these products. Also included in this collection are in-room menus covers. Custom pieces are available upon request. 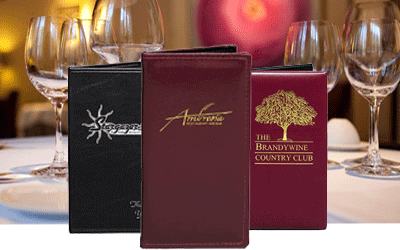 Table Tents are perfect for daily specials, desserts or drinks. Standard “A” Frame two sided helps promote specials or upcoming events. Turned and glued with raised panels and corners. Tents are available in many sizes and colors. Choose our multi-view table stands or clear acrylic stands. We now offer a three sided Table Tent as well. Standard and custom sizing are available.